Imagine upgrading the appeal and value of your home with your new tile flooring in Anderson, SC. Make this dream a reality when you shop for ceramic tile in our showroom. We carry numerous styles, patterns, designs, and colors so you are sure to find the floors that perfectly suit your needs. We feature a large assortment tile flooring in various shapes and sizes from industry leaders such as Floorcraft™ and Design Distinctions™, as well as convenient and affordable tile flooring installation services from experienced contractors. From the showroom floor to your home, count on us for unparalleled excellence in customer service. Stop by our showroom today with your ideas, and let one of our friendly design and sales professionals help you select the tile that suits your needs and your budget. Whether you want to highlight your minimalist tastes with classic, glazed white porcelain tile, or add earthy tones in the form of darker, unrefined, and semi-polished slate tile, we have a tile to match your preference. Our crew is standing by to begin the initial phase of your project, starting with a free, in-home pre-measurement. Not only is ceramic tile a smart investment in your home, but it only requires minimal care to maintain its beauty and appeal. Unlike hardwood that must eventually need to be refinished, ceramic floor tiles are scratch, stain, and moisture-resistant. Combine this with any of our comprehensive warranties, and your new floor can last for decades. If you’re ready for a change and a more appealing home décor, why not consider ceramic? Ceramic is great for people with allergies, because it does not trap dirt and other allergens. With this flooring, you can say goodbye to runny noses and coughing fits and hello to clean breathable air. Simple sweeping and occasional mopping is virtually all you have to do to keep your tile looking brand-new. Although typically used in a living room or den, ceramic floor tiles also add character and charm to the rest of your home. Light tile designs are a great way to amplify the natural light flooding into your home’s interior and brighten a gloomy bathroom or hallway. Want to redesign your bathroom? Add a ceramic backsplash to give your humble bathroom the appearance of a private spa. Ceramic is also a great option for the kitchen from flooring to backsplashes. Turn to our sales and design professionals to help you match tile to your home décor. The result is a win-win for your family and your home. A tile floor made of ceramic adds value to any room or area in which it is placed. Without a doubt, this flooring is a hot commodity in the housing market. More affordable than other flooring options, it is one small investment that can have a huge payoff when you sell your home. 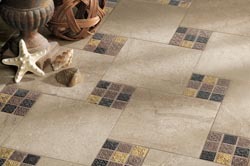 Add appeal and value to your home by laying beautiful ceramic tile on your floors. It is known to be a coveted flooring option so prospective buyers look for this flooring surface when choosing their new home. As you learn about the benefits of ceramic, we are sure you want to floor at least one--if not all--of the rooms in your home with this versatile floor covering. Like ceramic, porcelain is made of clay that is fired in a kiln. However, porcelain is made from a finer grade of clay and is fired at higher temperatures. The result is a surface that is stronger, denser, and more resistant to scratches. The price for porcelain tile is also a little more than its ceramic counterpart. Porcelain also offers a different appearance. While ceramic provides an elegant appeal, porcelain tile gives a contemporary look to any space it occupies. The clean, modern look of porcelain tile floors work well with any decorating style. Slate tile differs in many ways from other tile products. Slate is quarried from the earth and cut into slabs and then individual tiles. Because of this, it has a rich, earthy appeal with colors of gold, gray, green, blue, and orange. Slate is so distinctive that it does not require borders or patterns for the unique beauty of the individual tiles offer visual appeal in abundance. Slate is heavier than porcelain and ceramic and costs a little more. As this flooring is made of natural stone, it is tough and enduring as you would expect. Add the beauty of slate tile to your home. We strongly recommend professional flooring installation for all types of tile. Whether you choose a grid, a pattern, or a border, handling tile requires care and precision. Let us send experienced technicians to your home for tile flooring installation. These professionals have the tools and equipment to install all types of tile property. This flooring is heavy and not easy to handle. Individual tiles that are placed on the edges of a room also require cutting to fit properly. Also, tiles must be placed on a bed of mortar with grouting in-between to ensure that they remain in place. To ensure the enduring beauty of your tile floors, choose professional installation from skilled technicians. Contact us today for help selecting which ceramic tile suits your needs. We proudly serve the communities of Anderson, Greenville, Clemson, and Seneca, South Carolina.